If you have sent a deposit and want a Spring late April/early May puppy, please call me: (518)325-1230. Breeze had her litter of silver puppies, pictured above, on March 4th. Remember that silver puppies are born black, but will clear to silver as they mature. There are a few silver girls available. Gemini had her litter of black or brown puppies on March 13th. There are a few brown boys available. Our black, brown or silver puppies will be ready to go to their new homes by the end of April or early May. All adults have been tested. All puppies carry a two year guarantee. Please call for more information/pricing/deposit instructions: (518)325-1230. Our deposis are non-refundable, but can be applied to a future litter. Alexander Poodles will give $100 to anyone who puts an obedience title of CGC or higher on one of our puppies/dogs. At three months, a silver puppy looks like this handsome young boy. 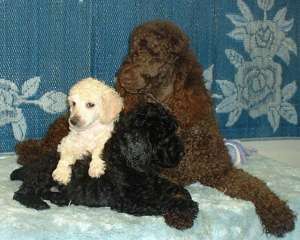 We at Alexander Poodles breed according to our waiting list. Our puppies are bred for beauty, brains, and temperament and make superior pets. Specializing in beautiful black, and exquisite silver and blue (dark gray) puppies since 1973. Occasionally, we also have brown or champagne puppies. Occasionally, Breeder's Terms are available. The Inn at Green River.